Starting a new business is a tough prospect in the competitive market of mobility. The industry has seen a growth in the consolidation of large suppliers, as well a rise in the number of established retailers building national portfolios, however, new entrants are still springing up and finding success. Combining good ideas with heaps of personal grit and determination, THIIS has highlighted six movers and shakers the industry should keep an eye out for. Opening in September 2017 on the doorstop of well-established competitors, East Coast-based Style Mobility has experienced the challenges and successes of mobility retail. After doing sales in a different industry and wanting something new, Dominic applied for a sales role advertised in a local newspaper for a mobility shop near him. Having stayed with the retailer for a year and a half and inspired by the industry, Dominic decided the time had come to run his own store his way. Dominic, with his business partner Simon, put some money together and started Style Mobility on the shores of Great Yarmouth. Having enjoyed success in just over the year since its doors opened, the journey has not been all smooth sailing for the coastal retailer, with Dominic recalling getting accounts with main suppliers being a biggest initial challenge. “Normally, if you wanted to buy something off a company, they’d be happy to sell it to you, however, in the mobility industry it’s not as straightforward as that,” he explained. Persevering, the retailer now has a number of suppliers on board, including some big fish it had set out to net when first launching. When asked about what makes Style Mobility stand out, Dominic put it down to great customer service and making what he described as a “big fuss” over customers. “A lot of these scooters cost several thousand pounds and a lot of the customers are elderly or vulnerable, so if they are choosing us, they deserve to be looked after and well taken of,” he said. The determined director also said that being proactive has also helped the retailer establish itself locally. “We don’t just sit here and wait for the work to come to us,” highlighted Dominic. Dom’s top start-up tip: Avoid greed: “Not to be greedy with your pricing,” states Dominic. The retailer intends to employ more sales people to work from one central hub, continuing with a more focussed approach. After that, another store opening could be on the horizon. Often, those launching a new business in the sector are doing so having worked or been involved in the industry beforehand. For brothers David Wilson, Commercial Director, and Peter Wilson, Financial Director of Brigg Mobility, this was not the case. Despite having no first-hand mobility experience, the pair launched Brigg Mobility in September 2018, bolstered by their comprehensive knowledge of the local community. “The location of Brigg Mobility, which is in Brigg in North Lincolnshire, is an area that we know very well,” explained David. It was whilst sipping a coffee that the pair decided on their new business venture in the market town. “We were sat in a coffee shop one day and in just one hour of sitting outside, we were passed by about 27 mobility scooters,” recollected David. Opening the store in the last week of September, David and Peter thought things would start slow, giving the company time to build a customer database and positioning itself ready to grow come the busy spring season. Whilst some would say being too busy is a good problem for a start-up to have, the mobility newcomers felt the strain of trying to maintain the levels of service with the sheer amount of demand in those early days, with staff having to work particularly hard. Discussing what makes the mobility retailer unique, David told THIIS: “Me, Peter and our technical manager Andy constantly review our business and brainstorm ideas. Alongside thinking outside the box, Brigg Mobility has begun branching out to neighbouring villages, running local roadshows to introduce mobility equipment to the community and raise awareness of the shop, which David confirmed has served the business well. David’s top start-up tip: Patience is a virtue: To see success in the mobility industry, David believes the key is to be patient with customers. “The future for Brigg Mobility is to become the number one place for the Brigg and the immediate community to shop,” concluded David. Starting in the mobility industry 18 years ago, Danny Frendo was a service engineer for Totally Active, before progressing into the role of area sales consultant when Totally Active was acquired by Simplyhealth. When the organisation abandoned its retail operations at the end of 2017 however, Danny was made redundant. Keen to continue working in the industry he loves, Danny decided to use his money to launch his own store – DF Mobility. One of the major problems people have in life is striking the right balance between work and leisure. For those running their own business, finding this balance becomes even harder explained Danny. “Since launching the business, we have dealt with some challenges, namely the lack of a work/life balance as I don’t think people realise what a personal investment starting and running a new business is and being ultimately responsible for answering the big questions,” he said. Reflecting on one his proudest moments in business, Danny mentioned being able to donate a £2,000 sensory kit to a local special needs school in Andover, Hampshire, as a Christmas gift. Danny’s top start-up tips: Danny advised that the recipe to success is knowing your products and your customers’ requirements whilst keeping overheads to a minimum and pricing fair and transparent. 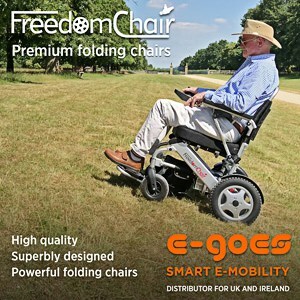 Established in 2016, Motion Healthcare was set up to import and distribute what it describes as the revolutionary Foldalite range of folding powerchairs. The company saw a gap in the market for lithium folding powerchairs and worked hard to help design and import the perfect range of products to fill the gap. When asked what has been the most difficult moment for Motion Healthcare so far, Tim Mills, Head of Business at Motion Healthcare, said that launching into the UK dealer network with already well-established had been a challenge. “That said, I have found that our combination of unique, innovative products and our commitment to be simple and enjoyable to do business with has helped massively grow the number of partners we work with in the last year,” he described. Alongside offering unique and innovative products and being an easy supplier to work with, Tim feels that there are other elements to Motion Healthcare that sets it apart from its competitors. “I believe what sets us apart from other suppliers in the trade is by being a smaller supplier, allowing us to apply the personal touch to the way we do business,” he said. Build on solid foundations: For a new company entering the competitive world of scooters and powerchairs, becoming an established and prosperous brand is no small feat. Tim pointed out, however, that success is built on some solid, fundamental foundations. “The key to success is to offer innovative products that offer end users something different and helps them in ways current products on the market do not,” he explained. “Equally important is ensuring the quality of these products is high to ensure that once sold, everyone is happy with the reliability and performance. “Our objective at this stage is to continue to bring innovative products to the UK market whilst we grow our network of dealers to the level where we are comfortable that our nationwide coverage is adequate,” concluded Tim. When George Goodger accidentally scratched the car of his lifelong friend Adam Wright, a mobility company and new innovation was born. Aiming to prevent scratches and dents caused to a car’s door sill by wheelchairs, the SillSave is a lightweight travel accessory that folds over the door sill, allowing wheelchair users to transfer in and out of their car with confidence of not damaging the sill. The company’s joint founder Adam Wright, explained how SillSave came into existence: “The idea of SillSave first came about when George accidently scratched the sill of my new car when he was trying to transfer from his wheelchair. After thoroughly researching and discovering that this was a common and unavoidable problem amongst wheelchair users, the idea of SillSave was born. Similar to how Dominic from Style Mobility said one of the main challenges for him was getting accounts with suppliers, Adam said that getting the acceptance for SillSave from retailers also proved difficult at times. “It’s very difficult to win over retailers with a product that has never existed and therefore not yet been proven,” he described. When asked about what makes Lovocco unique, Adam attributed it to the company’s strong ethics and values. “We have first-hand knowledge and experience of the challenges of day to day life in the disabled world,” he underlined. Adam’s top start-up tip: Gather feedback: If Adam could give one tip to a mobility start-up, it would be to gain as much feedback as possible from users and their market. In the future, Lovocco hopes to continue creating new products, continue improving the lives of people with reduced mobility and make a positive difference in as many ways as possible. Having revolutionised the product offering of a local independent manufacturing business in the early 2000s over a two-year period – bringing several products to market that are now everyday items in the mobility sector – Gemma was faced with the prospect of leaving the industry last year. With a passion for mobility and design however, she decided to start up her own business. Originally designing new bags, covers and holders whilst employed, an abundance of low-cost products entering the mobility market led to Gemma being made redundant in 2018. Loving her work, she decided to set up MyWren, a manufacturer of aesthetic wheelchair and mobility scooter accessories. Discussing her journey from employee to owner, Gemma noted that one of her biggest challenges was the responsibility of running her own business, where all decisions for the future of her fledgling start-up lay on her shoulders. Additionally, she underlined that funding for stock and reaching retailers across the UK had also proven an initial difficulty. “Thankfully, retailers quickly appreciated the quality, price point and trusted in the values of MyWren,” Gemma said. When asked about her proudest moment with MyWren so far, Gemma said that seeing her products come to life was exciting. “When my first delivery of products arrived, that was incredible!” she remembered. Keep it consistent: To be successful in the mobility industry, Gemma says that consistent advice and integrity keeps customers coming back and recommending her products. “When starting MyWren, we embraced the efforts of our retailers who are the front line of the industry,” she added. The manufacturer is now offering customised embroidery and plans to increase its range across 2019.